Thanks to Jestergoblin, I now am developing a bigger interest in minifigures. I have to say the little blind bagged Lego figures are just darn fun. When I saw the Marvel Megabloks single blind bags, I figured I’d take a chance. The first figure I happened to get was a plain Spiderman. It doesn’t get much more Marvel than that. He also appears to be one of the more common figures in the line. Where the Marvel Minimates are more of a block figure with a standard body, the Megabloks figures are more of the sculpted variety. Spidey here is no different. The first thing that struck me was he seemed a bit muscular. I’ve always thought of Spiderman as a thinner guy that moved more gracefully since he didn’t have much bulk. 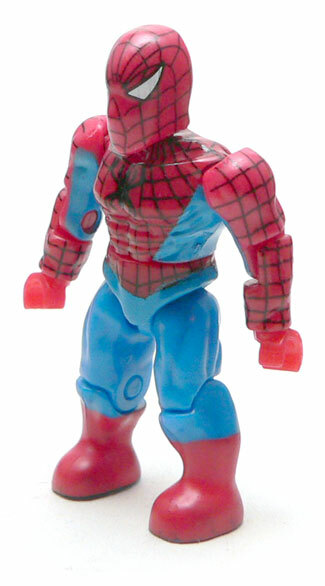 This Spidey looks like he’s been hitting the roids. The legs are the worst for this. They are really over muscled. Compared to the arms, it looks like he’s standing on a couple of tree trunks. Guess that is for jumping out of the way of stuff. Speaking of the legs, the red boots appear comically large. I understand in a figure like this there’s some exaggeration, but these look like moon boots. The red doesn’t have any web pattern on it either, making the legs look more like Superman than Spidey. The chest is really wide and this really contributes to the bulky look. I don’t mind the cut abs, but Peter Parker isn’t popular for his pecs. 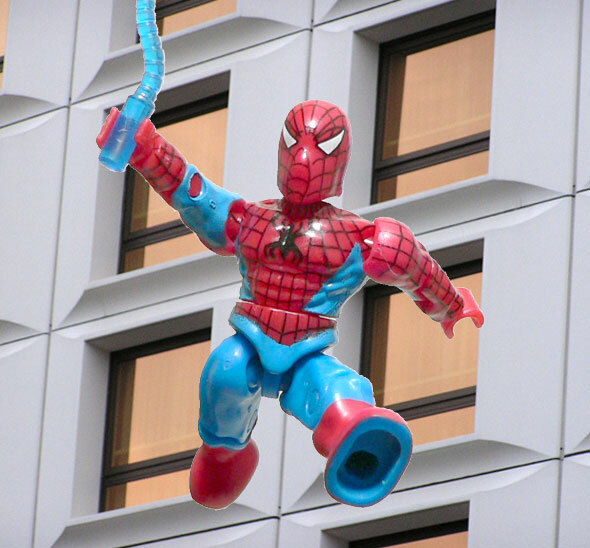 The body, arms and head all have webbing painted on. I have to say it looks good for this size. I dare say I’ve seen worse on bigger figures. 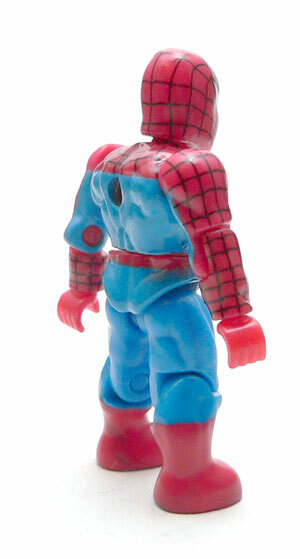 The spider on the chest, on the other hand, is a bit odd. the webbing doesn’t go under it and it only looks vaguely spider like. The head is ok. It looks like Spidey. It doesn’t have the oversize McFarlane eyes, yet I have to say there is something Spawn like in the sculpt. I think it’s the way the nose and mouth are sculpted. This whole figure could probably be repainted into a reasonable Spawn. Little figures always have a built in fun factor for me. You just want to pick them up and pose them. No exception here. I will say these little dudes come unassembled in their envelope. And it takes a pretty good “snap” to seat the pieces. A little more than I expected. The only joints that feel like they are going to come apart are the wrists, which have very tiny pins. The movement of the ball jointed shoulder and hips seems to be a little limted by the design. You’re probably not going to get this Spidey into some of his more extreme poses. The head is also more limited than what I would have expected. 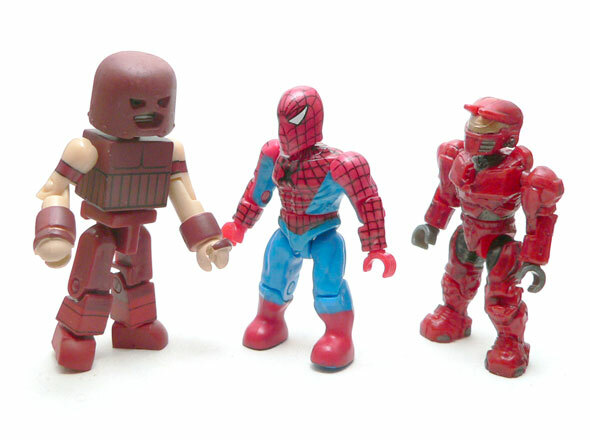 Spidey comes with three accessories. The first is a generic 8 stud block that most people will chuck over their should like socks at Christmas. Next up is Spidey’s whip. Huh? Well, I’m sure it is meant to be some sort of web thing, but it comes across as a whip due to the undulating nature of the piece. 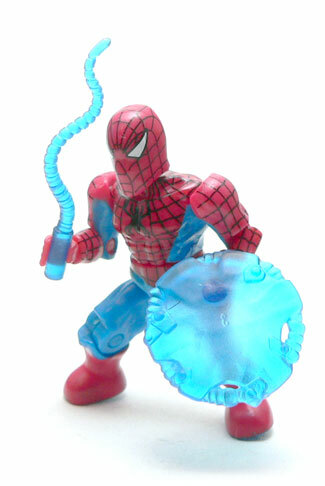 It’s also molded in a translucent blue, which doesn’t help it look webby. The third accessory is his shield. The thing looks a bit like a techy hoop with some leather stretched over it. 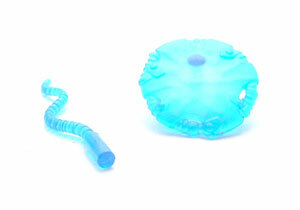 Again, the piece is molded in a translucent blue. When I felt the large flat piece in the bag I thought it was part of the Goblin’s Glider, which is why I picked this figure. There is a post on it that lets you put it on his back or hold it. Maybe it’s a saucer sled. Is this a perfect version of Spiderman? No, probably not. Is it a cool little desk ornament? Yeah. I’d give it that status. While I like Minimates, the blind bag nature of these is fun. The fact they are sculpted instead of block figures adds a bit to them as well. I’ll probably pick up a couple more of these little guys just for the fun of it. Whoa – better change my review schedule for tomorrow because it is WAY too similar to yours, guess I’ll kick off with Iron Man! These figures are decent, but not great. After the very, very disappointing second round of Halo figures, I was reluctant to grab these. But if there is one character I can’t say no to, it’s Green Goblin.